Peter Racine Fricker’s The Vision of Judgement is classed by me alongside Gordon Crosse’s Changes (review), Mátyás Seiber’s Ulysses (review) and William Mathias’ This Worlde’s Joie as largely forgotten and almost completely ignored masterpieces. All four works should have a strong and secure place in the repertoire, but have fallen by the wayside: they are all represented by only a single recording. Fricker’s music has suffered an almost total eclipse. A handful of major compositions are currently available on CD (see Arkiv catalogue). This includes the Concerto for violin, op.11, two sonatas for violin and piano (review review) and one for cello and piano. There are a few other smaller pieces. In the past sixty years there have been commercial recordings of his Symphony No. 1, op.9 (Robert Whitney/Louisville Orchestra - Louisville S-675 (LP) (1967)), Symphony No.2, op.14, Wind Quintet, op.5, String Quartet No.2 op.20, the Prelude, Elegy and Finale for string orchestra, op.10 and the Horn Sonata, op.24. A few piano pieces, organ works and choral numbers have appeared in the catalogues. Several pieces have been uploaded to the internet from wireless broadcasts. The Vision of Judgement ‘has been likened to William Walton’s much more popular Belshazzar’s Feast (1931) in both composers’ use of ‘polished and sophisticated barbarity’ as well as sharing ‘astringent harmonies … rhythmic vitality, exotic touches, the eminent singability, and the enormous technical ability of the composer.’ (Irving Lowens, Notes, December 1958). Both were commissioned by the Leeds Festival. John Quinn has given a detailed discussion of these two works in his first-rate and enthusiastic review published on MusicWeb International. Paul Conway has been meticulous in his description in the excellent liner-notes. I will add only a few general notes and comments. The apocalyptic text of The Vision of Judgement was derived from the poem ‘Christ’. It is usually declared to be written by Cynewulf, who was most likely a Christian poet living in Northumbria during the 8th or 9th centuries. The poem is based on a homily on the Ascension by St. Gregory the Great. There is no indication in the liner-notes as to who was the translator of the Old English original. Also included in Fricker’s libretto are elements of the Roman Mass and the Office for the Dead. The Vision is scored for soprano, tenor, chorus and orchestra with additional brass and organ. The majority of the oratorio utilises the chorus: the soloists have only one aria each and a duet. The first performance was given at the Leeds Town Hall on 13 October 1958. The Philharmonia Orchestra was conducted by John Pritchard and the soloists were Claire Watson and John Dobson. The Vision of Judgement effectively falls into two parts: the fear and confusion of the ‘last judgement’ and the ‘great light’ revealed in the conclusion. There is an unaccompanied interlude, a setting of the Libera Me, Domine (Deliver me, O Lord). This interlude is the most moving part of the oratorio. If The Vision of Judgement has a fault, it may be that there is insufficient contrast between these two sections: of terror and of solace. However, I was not conscious of this dichotomy in this performance. The horrors of judgment leading to eternal death are satisfactorily put to rest by the second section’s paean of joy and praise. It may be argued that the composer ‘got carried away by the idea of ‘sound loud and immeasurable’’. Edmund Tracey (The Observer, 1 July 1962) wittily remarked that ‘when the choir sang of the trumpets that would be heard “from Pole to Pole … resounding” [he] had no inclination to doubt them.’ Certainly there is a considerable amount of powerful and complex choral writing and he indulges in ‘a pulverising use of a gigantic brass choir …’ (op.cit.). Yet, bearing in mind the subject matter, written at a time when the Cold War was always in danger of becoming ‘Hot’, it is not an inappropriate response. This present performance was broadcast on 14 October 1980 during the sixth of seven programmes featuring Fricker’s major choral and orchestral music. This was part of the Fricker 60th Birthday Celebrations. It is likely to have been recorded at the Leeds Festival on 19 April 1974. Five years later (13 December 1985) it was again heard on Radio Three, this time with the BBC Symphony Orchestra conducted by Brian Wright. The other work in that radio concert was Michael Tippett’s influential Symphony No.1. 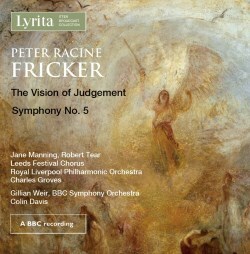 The Guardian (14 October 1958) reviewer of the Leeds premiere expressed a belief that Fricker’s A Vision of Judgement would have ‘a reasonable chance’ of holding its own against other Festival premieres, including Vaughan Williams’ Toward the Unknown Region and Walton’s Belshazzar’s Feast. It was not to be. Let us hope that the publicity around this present CD release will bring this great oratorio back into the musical public’s imagination. Alas, something tells me that listeners will have to be content with this recording but one can have a fond hope that new performances and recordings may be more than just a pipe-dream. Peter Racine Fricker’s Symphony No.5, op.74 (1975-6) for organ and large orchestra was commissioned by the BBC as a part of the 11-day Royal Festival Hall Silver Jubilee celebrations. The premiere - the performance presented on this CD - was given on 5 May 1976 by the BBC Symphony Orchestra conducted by Colin Davis with the organist Gillian Weir. Other works heard at this concert included Dvorak’s Cello Concerto (substituted at the last moment for Elgar’s Cello Concerto) and Michael Tippett’s The Vision of St Augustine. A time limit of twenty minutes was imposed on Fricker’s inspiration which he was able to meet with a few seconds to spare. In fact, this is a symphony that seems to be more imposing than any time constraint would suggest. It may be compact in length, but the vision is impressive. The Symphony No.5 includes an important, but not overbearing, part specially tailored for the Royal Festival Hall organ. This is not conceived as a concerto: the soloist fulfils a concertante role. Paul Conway notes the structural balance between organ solos and long passages when the instrument is ‘tacit’. It is surprisingly effective. Fricker, writing in The Times (6 May 1976) pointed out that his symphony is ‘cast in a single movement, basically in three sections: fast, slow, fast …’ He further explains that each section has ‘several subdivisions, and the material tends to be transformed in various ways.’ Conway explains that the composer uses thematic transformation to ‘give the impression of being in continuous variation form, rather than having clear-cut first and second subjects.’ Fricker has introduced cyclic elements with references back to music heard earlier in the symphony. The Symphony is "Dedicated to the many fine musicians with whom I have worked so happily in the Royal Festival Hall." Stephen Walsh, reviewing this novelty in The Observer (9 May 1976) felt that the symphony was ‘a pale reflection of those arresting Bartókian symphonies which first made Fricker’s name.’ Other reviewers noticed problems of balance between the various sections of the orchestra. Certainly, this piece is hardly a celebration, in the sense that the music is not flamboyant, but typically introverted. There are some outbursts of passion, but more often than not the mood is reflective and solemn. This is a powerful work, with effective orchestration and considerable brilliance, in spite of the seriousness of the music. John Quinn, in his review, has noted that he ‘respects’ this score, but it doesn’t ‘excite’ him. I found it a dramatic and satisfying symphony that benefited from hearing more than once. I have also heard the recording currently on YouTube with Jennifer Bate and the BBC Northern Symphony Orchestra conducted by Christopher Adey. I understand that this was generated from a BBC broadcast made on 21 October 1980 on Radio 3. It is of considerably poorer sound quality. Interestingly, I found a reference to a record of the present Symphony No.5 issued on Aries LP-1614. It is coupled with Rainer Kunad’s Concerto for organ, double string orchestra and percussion. I am not sure of the date of recording: I neither own, nor have heard this LP. The liner-notes for this present CD by Paul Conway are impressive. They give a definitive, detailed historical and musical analysis of both compositions and an overview of the Fricker’s life and achievement. The text of the Vision is included. The tape transfer and restoration is masterfully accomplished by Mike Clements. It is tantalising to wonder what other treats are hidden in Richard Itter’s archive of ‘off-air’ recordings. Recent issues have included important symphonies by Arnold Cooke and William Wordsworth, Walter Leigh’s Jolly Roger, Phyllis Tate’s The Lodger and Arthur Bliss’s The Beatitudes. Let us hope that there are plenty more in the pipeline. (Stop Press: I note that major works by Iain Hamilton and Anthony Milner are already available from Lyrita). I do hope that one day some adventurous and enterprising record company will release new recordings of Peter Racine Fricker’s cycle of symphonies and other orchestral music. To me, it would be much more worthy than yet another cycle from one of the ‘greats’.